Home » Ford F-150 » What is Ford F-150 EcoBoost®? What is Ford F-150 EcoBoost®? If you’ve been looking at the 2019 Ford F-150, you might have noticed that Ford is offering six different engines for it across all trim levels. Three of these engines are designated with the term, “EcoBoost®.” What exactly does this word mean? EcoBoost® is a series of turbocharged, direct-injection gasoline engines produced by Ford since 2009. EcoBoost® engines are designed to deliver power and torque consistent with larger-displacement, naturally aspirated engines while achieving about 30% better fuel efficiency and 15% fewer greenhouse gas emissions. That’s an extremely impressive combination of power and efficiency. Ford has found this strategy to be less costly and more versatile than further developing or expanding the use of hybrid and diesel engine technologies. 2.7L Turbocharged EcoBoost® – 325 hp and 400 lb.-ft. of torque. 3.5L EcoBoost® – 375 hp and best-in-class* 470 lb.-ft. of torque. High-Output 24-valve 3.5L EcoBoost® – Best-in-class* 450 hp and 510 lb.-ft. of torque. Standard in the Raptor and top-of-the-line F-150 Limited. These three EcoBoost® engines are all fitted with the Ford port-fuel and direct-injection system (PFDI). They have two injectors per cylinder- one in the air intake port, another inside the cylinder- to increase performance, along with twin inter-cooled turbochargers. They also boast dual overhead cam design with variable intake/exhaust cam timing. The upper block and cylinders are made of the same high-strength compacted graphite iron used in the Super Duty® 6.7L Power Stroke® Turbo Diesel engine. What transmission are 2019 Ford F-150 EcoBoost® engines paired to? All three of these engines go through an advanced 10-speed automatic transmission. Features on this transmission include optimized wide-span gear spacing coupled with drag-reduction actions, plus three overdrive gears. It boasts five selectable driving modes: Normal, Tow-Haul, Snow-Wet, EcoSelect, and Sport. Want to try out the EcoBoost® engines for yourself in the Brainerd MN area? Contact us today to schedule a test drive here at Kimber Creek Ford. 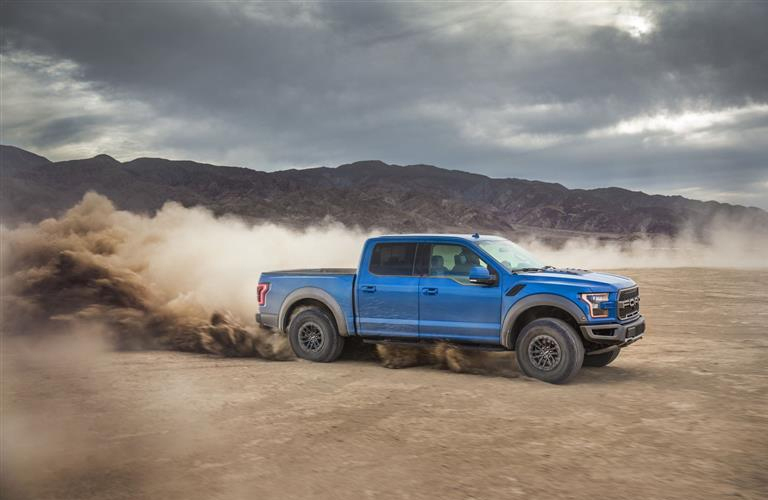 What are the Off-Road capabilities of the 2019 Ford F-150 Raptor? Trail Control Now Available on the Ford Raptor! This entry was posted on Friday, January 18th, 2019 at 2:38 pm	and is filed under Ford F-150, Performance. You can follow any responses to this entry through the RSS 2.0 feed. You can skip to the end and leave a response. Pinging is currently not allowed.